The English in the 18th Century attempted to prohibit the wearing of the kilt in Scotland as part of their effort to destroy Scotish culture and continuing resistance to English rule. Queen Victoria, who was enamored by Scotland, taking extended vacations at her Balmoral estate. In the mid-19th Century popularized kilts for boys when she began outfitting her boys in kilts. The fashion soon spread to the United States where kilt suits were introduced. It was the perfect fashion for doting mothers dispairing of their sons growing up to fast and having to dress them in trousers. The kilt suit was a natural transition for boys who had grown to old for dresses. The style was not limited to Scoland and England. Affluent Americans generally looked to England as the arbiters of good taste and were soon also dressing their sons in kilts. Scottish ancestry had little to do with the choice of kilts, although families with actual Scottish ancestry might be particularlyblikely to folloe the style. Mothers of the era loved to dress their sons in kilts and fancy blouse. Younger boys were dressed in bodice kilts rather than proper kilts, usually without sporrans. 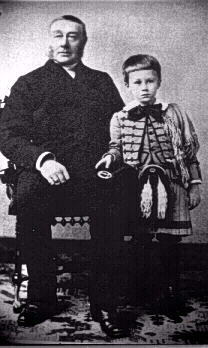 Kilt suits for little boys were quite popular in America. 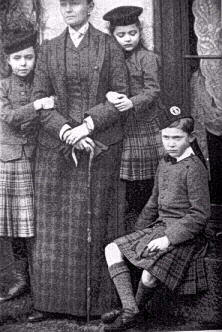 Some mothers even selected sailor kilts, sailor suits with middy blouses, but a kilt instead of short trousers. (As the kilt was of the same material as the blouse and not plaid it was more of a skirt than a kilt.) Older boys wore proper kilts, but with a variety of shirts varying from lace trimed blouses to shirts with stiff Eton collars and bow ties. Boys kept dressed in kilt suits after graduating from their baby dresses and smocks would usually not have their hair cut and often wore curls or bangs. While in kilt suits, it was not unusual for boys to wear hanging curls and perhaps bangs but the curls were cut when the boy was finally breeched (allowed to wear pants), an occasion which would brought tears to the eyes of many a doting mother. Accounts vary as to the attitude of boys to kilts as oposed to other styles prevalent at the time. Some clearly disliked the kilt as girlish. Others thought Fautleroy suits with lace collars and Russian tunics to be worst. Probably the favorite of most boys before they graduated to more adult-looking styles was the sailor suit. Kilt suits became increasingly rare after the turn of the century, but kilts have continued into modern days. Some schools in Scotland and Ireland adopted them as a school uniform. This is no longer the case, but they are still commonly worn for dress occasions at many Scotish schools. Some of the boys don't much like the idea, especially the English and occasional American boys at the schools. Kilts are also worn by Scottish boy scouts. They are also seen at highland gatherings around the world and at formal occasions. Irish boys around the world wear them at step dancing competitions called feises. Ring bearers in Scotland and England also sometimes wear kilts.